William Hope Hodgson's 'The Night Land' is certainly one of the classics in both the horror and fantasy genres. It's also more problematic than a politician in a parole office. Consumed with a searing vision, Hodgson chose to convey that vision in a style that is the wrong side of dreadful. Possessed by a deep horror, Hodgson chose to compensate with a sickening sentimentality. This much is pretty clear. But the story doesn't end with the publication of the novel in England by Everleigh Nash and G. Bell & Sons in England in 1912. 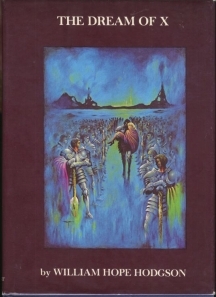 Unable to find a publisher in the United States, but wishing to prevent piracy, Hodgson undertook to cut 'The Night Land' from 200,000 word to 20,000. He edited it himself and re-titled the 'The Dream of X', and published about 0 copies in 1912 via R. Harold Paget. In 1977, Sam Moskowitz found this manuscript and published the story in a 140 page limited edition of 2500 copies. Artist Stephen Fabian was commissioned to illustrate the book. Great wonder ensued. This publication shows what a publisher dedicated to wonderful, readable editions can do. Hodgson's 'The Night Land' is a long work that many readers might not have the time or the patience to read. This edited version by the author himself preserves the flaws of the original to a certain extent. The prose can't be purged. It's florid enough to give Lovecraft himself pause. (In his work of criticism 'Supernatural Horror in Literature'). The work itself is filled with the kind of deep time and awe found in the works of Stephen Baxter, Arthur C. Clarke and Alastair Reynolds. Hodgson is able to convey vastness with a frightening ease. He evokes otherness and the loneliness of the universe with his visionary fervor. However more of this work than one would prefer is devoted to wrapping one's arms around one's true love. As strong as the sentiment might be, it's devoid of the originality that haunts Hodgson's bleaker visions. But this publication is a lot more than just the prose. First and foremost, it is the creation of a master editor and researcher who has unearthed a real gem of the current horror and fantasy canon. Moskowitz certainly deserves a lot of credit for making a nearly unapproachable yet masterwork level bit of fantasy horror much more digestible. Illustrator Stephen Fabian captures Hodgson's visions in a beautifully printed 1970's style. Donald M. Grant -- no ISBM number yet! -- put together a wonderfully printed package. If you're interested in the history of fantasy, horror and science fiction, then this bit of history is certainly worth seeking out.